Elizabeth was born in 1437, probably at the Woodville (also spelled Wydeville) family home in Grafton. She was the eldest child of Sir Richard Woodville of the landed gentry and Jacquetta, Duchess of Bedford. Jacquetta was the daughter of Pierre de Luxembourg, Count of St. Pol and she was the widow of John, Duke of Bedford, brother of King Henry V. Jacquetta’s subsequent marriage to a mere knight had created a scandal. They had married without royal permission and were forced to pay a heavy fine so there was a family history of marrying for love in the Woodville family. Based on the evidence of Elizabeth’s later life, she appears to have been an educated, intelligent child who was close to her parents and grew up to be a real beauty. The Woodville family was large and appears to have been a loving one. It was common practice to send children to live in the homes of other families and Elizabeth may have been sent to board in the home of Sir Edward Grey and his wife Elizabeth, Lady Ferrers at Groby Hall in Leicestershire. In the early 1450’s when Elizabeth was a teenager, a Yorkist gentleman, Sir Hugh Johns had met her and wanted to marry her. However, the marriage never materialized. Part of Elizabeth’s living arrangement may have included a marriage between Elizabeth and the Grey’s eldest son John. The Grey’s lived close to the Woodville home so Elizabeth could have divided her time between the two places. There is no record of the marriage date for the couple. They most likely lived in the Grey’s second manor home of Astley in Warwickshire where Elizabeth gave birth to two sons Thomas and Richard. Very little is known of her life during these next ten years but she would have been responsible for the running and maintenance of the family home, especially when John was away on business. During the 1450’s, discord arose over the government of the kingdom of England between the Lancastrian King Henry VI and the Duke of York and his family, conflict which would come to be known as the Wars of the Roses. At first the Woodville and the Grey families were not significantly influenced by the troubles but eventually sides had to be chosen and both families committed to support the Lancastrian King. Unfortunately, Elizabeth’s husband Sir John Grey perished in the second Battle of St. Albans in February of 1461 and she returned to her parent’s home with her sons. The new King Edward IV, son of the Duke of York, went on to win the Battle of Towton at the end of March and on his return to London, he stopped at Stony Stratford near the Woodville’s home of Grafton and spent two days there in June. He may have met Elizabeth at this time. Elizabeth’s husband had provided an inheritance for their eldest son and income for his wife but Elizabeth’s in-laws were not acknowledging these wishes. In fact, Lady Ferrers was asking Elizabeth to pay the remainder of her dowry! 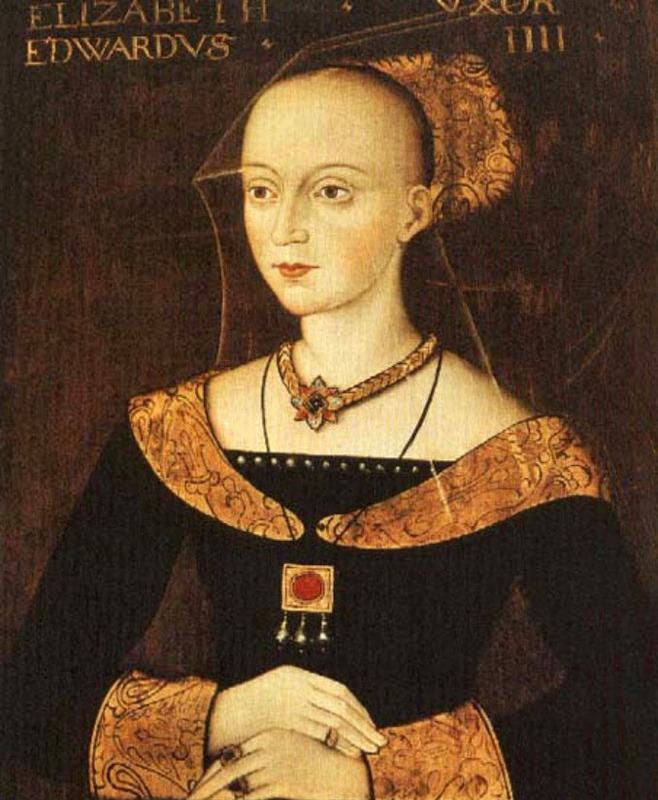 In April of 1464, Elizabeth made an arrangement with King Edward’s friend and chamberlain William, Lord Hastings to remedy the circumstances and she may have asked the king for assistance in sanctioning this bargain with Hastings. Sometime shortly after this, Edward married Elizabeth to the surprise and shock of his government. The proverbial story says they married in secret on May 1 in a ceremony arranged by Elizabeth’s mother Jacquetta but this may be an invention of the chroniclers. Edward did stop at Stony Stratford in the spring of 1464 on his way to put down unrest in the north. It is more likely he visited again on his way back and they were married in the late summer. What is known is that during a council meeting in September, Edward was forced to admit he was already married when the councilors insisted he agree to marry the French princess Bona of Savoy. The men in the room were probably stunned if not downright angry. The marriage was viewed as unprecedented as well as impolitic. Elizabeth was formally introduced to the court on September 29. The king’s brother, George Duke of Clarence and Richard Neville, Earl of Warwick lead her into Reading Abbey and she was openly honored as queen. Preparations began for her coronation after the New Year and the magnificent ceremony was performed on May 26, 1465, followed by a splendid tournament in Westminster sanctuary. She was given the palaces of Ormond Place, Pleasaunce aka Greenwich, and Sheen and she spent time at Eltham, Windsor and Westminster. After initial tense moments during the early reign of her husband, the couple shared a relatively happy life together. Edward was a confirmed womanizer but Elizabeth overlooked his infidelities. Their first child was Elizabeth of York, born on February 11, 1466 and this daughter would play an important role in English history. Other children were Mary, Cecily, Edward, Margaret, Richard, Anne, George (died young), Catherine and Bridget. Her last child was born when Elizabeth was forty-three. Elizabeth and her extended family improved their social standing and wealth due to the largess of King Edward. Her brothers and sisters married into many of the noble families of England. Advancement of the Queen’s family was standard practice in medieval times. In the case of the Woodvilles, none of these marriages and advancements would have occurred without the express approval of the king. This would cause resentment which would create trouble later, especially with the Earl of Warwick and King Edward’s brothers George, Duke of Clarence and Richard, Duke of Gloucester. The established nobility considered the Woodvilles to be upstarts due to Sir Richard having been born a commoner. However, Jacquetta’s heritage was undeniably of the European nobility and she had married an English Duke. Elizabeth was a prudent and meticulous businesswoman regarding her properties and finances. Edward endowed her with a generous secure income and she was thrifty in administering the funds. The couple spent the majority of their time together thereby saving expenses. She was a patron of Queen’s College, Cambridge and also Eton College. She made visits throughout the realm where the people cordially welcomed her. In 1469, the Earl of Warwick and the king’s brother Clarence rebelled against King Edward, partly due to resentment against the Woodville family among other reasons. Warwick did manage to capture Elizabeth’s father and brother Sir John Woodville and he had them summarily executed. 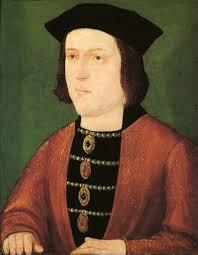 King Edward was later forced into exile and sailed for Burgundy while Warwick restored Henry VI to the throne. Elizabeth was compelled to seek sanctuary in Westminster Abbey where she gave birth to her first surviving son Edward. With the support of his sister Margaret, Duchess of Burgundy and brother-in-law Charles the Bold, Edward returned to England with troops in April of 1471. After reconciling with Clarence and defeating and killing Warwick at the Battle of Barnet, Edward entered London, king once again. He was delighted to return to his family and his new male heir. There was one more battle against Henry VI’s queen Margaret of Anjou and her son Edward at Tewkesbury. Margaret’s son was slain and Henry VI died in the Tower of London soon after, most likely at the orders of King Edward IV. In June, the infant Edward was made Prince of Wales and Elizabeth was named head of his council. Elizabeth and the king went on pilgrimages together to Canterbury in 1471, Oxford in 1472 and Shrewsbury in 1473 where she gave birth to her second surviving son Richard. That same year, Prince Edward was sent to Ludlow and his own household was established under the guardianship of Elizabeth’s brother Anthony Woodville. Her son Thomas Grey was also sent to Wales on various commissions. In 1478, Prince Richard married the wealthy heiress Anne Mowbray and he became Duke of York. Elizabeth was in charge of managing Richard’s Norfolk estates. King Edward’s unexpected death in April of 1483 was a severe blow to Elizabeth and her family’s fortunes. Tensions were running high. It was decided King Edward V would be brought back to London from Ludlow by Anthony Woodville and Elizabeth’s other son Richard Grey with Edward’s coronation planned for May 4. 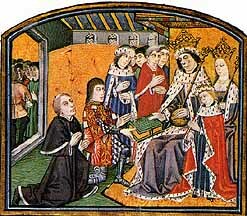 As the new king made his way to London, his entourage was intercepted by Edward IV’s brother, Richard, Duke of Gloucester. Anthony Woodville and Richard Grey were imprisoned. Because Elizabeth’s father and brother John had been executed a few years before, she was apprehensive about her own safety and that of her extended family and children. Consequently, Elizabeth fled into sanctuary in Westminster Abbey once again taking her son Richard and her five unmarried daughters and her mother. Gloucester was named as Lord Protector to King Edward V who was brought to London and lodged in the Tower, presumably to await his coronation which was postponed until June. Gloucester and the council did their best to persuade Elizabeth to come out of sanctuary. She resisted. Gloucester was depicting the Woodvilles as enemies of the new regime and Elizabeth was accused of plotting against Gloucester with Lord Hastings and others. Hastings was summarily executed over this alleged plot of which there is no historical evidence. Elizabeth had been under pressure for weeks to surrender her son Richard of York to Gloucester. On June 16, Cardinal Thomas Bourchier, Archbishop of Canterbury lead a delegation to convince her to give up her son. He explained York was needed to attend his brother’s pending coronation and he also personally guaranteed York’s safety. In addition to this coercion, Gloucester had ordered troops to surround the sanctuary building and these men made it clear they would use force to take the child from her if necessary. Edward IV and the Duke of Gloucester had violated sanctuary in the past. After the Battle of Tewkesbury in 1471, men were forcibly removed from the nearby abbey and executed in complete violation of the terms of sanctuary. Elizabeth had no other options available and turned over her son. Both the boys were lodged in the Tower of London where they disappeared, never to be seen again, purportedly murdered upon the orders of Gloucester. The coronation was postponed once again. Elizabeth’s marriage was declared invalid because Edward IV had supposedly been pre-contracted to marry someone else before he married her. All of her children by Edward IV were pronounced to be illegitimate. Gloucester used this as justification to have himself declared King Richard III on June 26. On June 25, Elizabeth’s brother Anthony and son Richard Grey had been executed at Pontefract Castle. Elizabeth remained in sanctuary with her daughters. With many presuming Edward V and his brother were dead, the girls became potential figureheads for rebellion with the object of dethroning Richard III to put one of them in his place. When the Duke of Buckingham led a revolt in the late fall of 1483, Henry Tudor’s mother Margaret Beaufort and Elizabeth participated. Henry was the only remaining male of Lancastrian ancestry and Elizabeth and Margaret discussed marrying Elizabeth of York to Henry. Elizabeth’s son Thomas Grey and her brothers also participated in the uprising. But this rebellion was thwarted and Buckingham was executed. Many of the rebels and others who were disenchanted with Richard III went into exile to join Henry Tudor, and support him in his bid to dethrone Richard III. At Christmas 1483, in Rennes Cathedral in Brittany, Henry Tudor swore in front of many Englishmen to marry Elizabeth of York, in essence ending the Wars of the Roses and uniting the houses of Lancaster and York. In January 1484, Parliament confirmed Richard as King of England. They also confirmed Elizabeth was never legally married to Edward IV, her children were illegitimate and she was no longer Queen, merely Dame Elizabeth Grey. Elizabeth’s son Thomas and her brothers were condemned by bill of attainder. Richard III’s victory was complete. Elizabeth saw the writing on the wall. There was no longer any need for her to remain in sanctuary. She agreed to all of Richard’s terms but only if he swore in public to do no harm to herself and her daughters which he did on March 1. The king agreed to support her daughters and find them good husbands. He did allow Elizabeth of York to attend his Queen Anne Neville at court and did not molest the girls. Elizabeth herself left sanctuary under the guardianship of Sir John Nesfield and her whereabouts at this time is unknown. In the summer of 1485, Henry Tudor invaded England and defeated and killed King Richard III at the Battle of Bosworth. 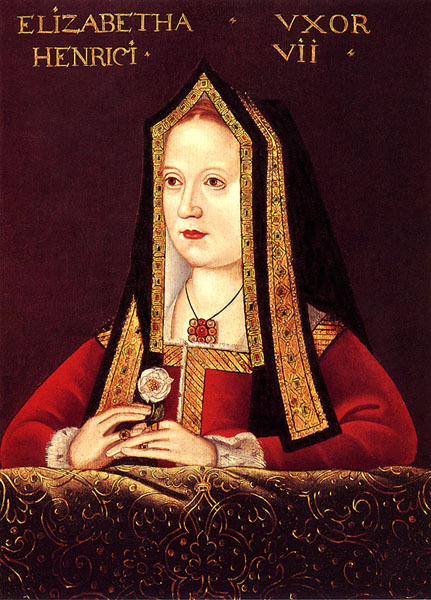 Henry married Elizabeth of York and the Dowager Queen Elizabeth enjoyed great favor in the new king’s reign. In March of 1486, her dower lands were restored. She attended many court functions and maintained a comfortable household. She joined her daughter in her confinement chambers shortly after the birth of her grandson Arthur Tudor in September 1486. This was a happy occasion and Elizabeth was named godmother to the infant and attended his christening. In February of 1487, the king’s council deprived Elizabeth of her dower lands and income. It just wasn’t financially feasible for the king to pay double dowers for his mother-in-law and his queen. Elizabeth was given a pension and moved into the state apartments once used by the Earl of Gloucester at Bermondsey Abbey. Also at this time a match was considered for her with James III, King of Scots but nothing came of it. She continued to receive gifts from the king and attend court functions. She was present at the birth of her grand-daughter Margaret Tudor in late November of 1489. Elizabeth made her will in April of 1492. She had little in the way of worldly goods and commended herself to her daughter the Queen. She died on June 8 and four days later was buried in a simple ceremony next to her husband in St. George’s Chapel at Windsor. The status of Elizabeth Woodville’s character has been denigrated ever since her unforeseen marriage for love to King Edward IV in 1464. There was a great deal of unfair and negative propaganda at the time against her and her extended family and this propaganda has been perpetuated for hundreds of years. However, recent historians have re-evaluated her position and influence during Edward’s reign and after. The biographies of Arlene Okerlund and David Baldwin have accomplished a great deal in restoring Elizabeth’s character and standing in history. I don’t won’t to log out .I’m very interested in Elisabeth woodville .and the Tudors . This is the first I have ever read that Henry couldn’t support his mother-in-law in style. Is there a source for that? It does not say he couldn’t support her in style. What is says is it wasn’t financially feasible to pay full dowers to two queens. 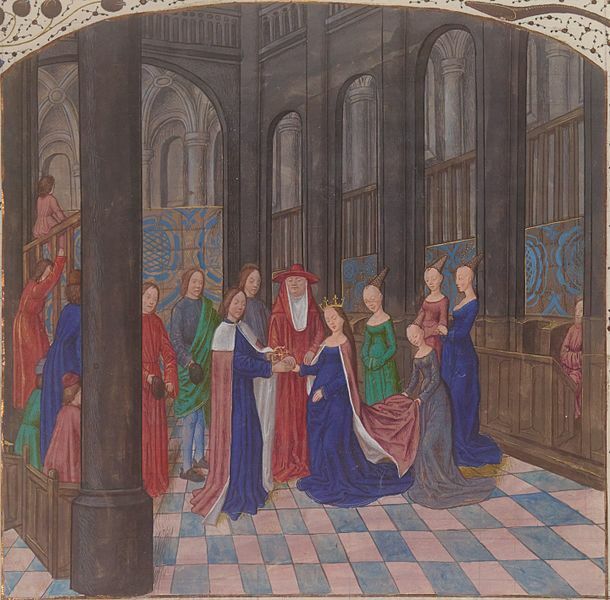 This situation had only occurred in one instance before in history when Joan of Navarre was still living at the time Henry V married Catherine de Valois. See the sources listed at the end of the article. It was rare, in that age, for a queen dowager & queen regnant to both be alive at the same time. 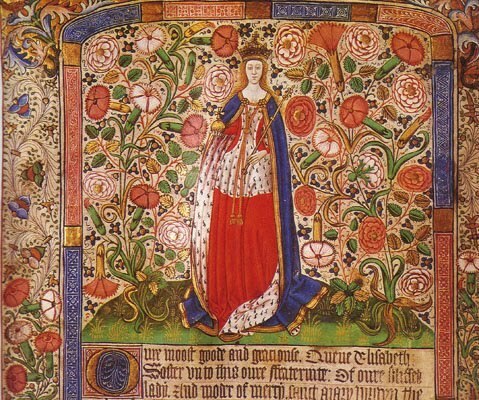 Remembering also that Edward IV’s queen brought little property & wealth into her marriage, her dower was almost totally a gift from her husband from royal properties. It was hardly a cut-and-dried arrangement. Much of what she had would have naturally reverted to her first son after Edward’s death, and she’d receive her widow’s thirds to live on. When she died, all would become the King’s property, which was usually turned over to the new queen for her maintenance. The problem was that everything went topsy-turvey when Henry VII was crowned. Margaret Beaufort was, as the king’s mother, entitled to royal maintenance, as well as Henry’s own wife, the young queen Elizabeth. That made one extra woman to support who was, in ordinary times, nonexistent. Remember, too, that Henry was trying to bring England together after the wasteful wars with Richard III, as well as the Rose Wars fallout. Henry might have died with stuffed coffers, but he didn’t start that way! It took years for him to establish his authority, consolidate his kingdom, and subdue the overweening barons that had plagued England’s internal security for generations. He just didn’t have the means to support all three women & have much left to work with. His mother-in-law was treated as honorably as possible, but she was pretty much left with what would have been hers after her first husband died & her Grey sons inheritances. Elizabeth Wydeville lost all because she was the queen’s mother, not the king’s. Henry refused to allow his Elizabeth the authority she was entitled to for fear it would undermine his authority. He even waited until after she bore a child to have her crowned. He was never truly easy about his own crown, and after the deaths of Prince Arthur & his Elizabeth, kept Henry of York on a short leash. This was partly due to York being his only surviving son, but also because York’s claim to the throne was stronger! York was a robust boy with a strong will. He knew where he stood, and could be dangerous to his father. History proved that! Of course many other factors were involved with this situation. Nothing is ever crisp & clear when it comes to England’s monarchy! I really enjoyed this post. It is excellent to see a historical example of a woman who was more than just beautiful but also intelligent and loyal to her family! I have a much better understanding of this period of history now after reading your insightful article.. Thank you. Another great job cleaning out the cobwebs and the misconceptions by centuries of male chroniclers! The current situation with men in power, who are finally being made accountable for mistreating women, makes your research and publications critical! Nothing against men, but too many of them have issues against women as people. We all need to guard against objectification of women, even if some of us have never really been bothered by or considered it a personal problem, By cleaning the history house we can lay new groundwork in what is taught, as well as accepted as truth. Today’s boys may slough it of, but I do hope today’s girls will have better images of themselves when THEY reach womanhood! Susan, I eagerly await your next work! The picture of Elizabeth in her coronation outfit on the background of carnations is especially beautiful. Thank you for setting out all of this so clearly. It was a very murky period. Everything I’ve read about Elizabeth Woodville has condemned her and her relatives, so it was good to have the other side. Fascinating. What resilence she had. Poor woman, to lose two sons in the Tower. But she still went on to lead her daughters to good marriages and full lives. A remarkable woman who enjoyed the satisfaction of marrying for love. Great post!